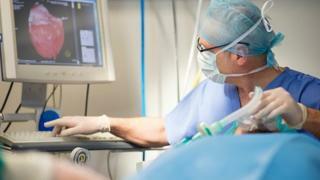 Cardiac patients facing delays in north east Scotland have been offered treatment as far away as Newcastle. NHS Grampian confirmed that an agreement on the treatment of heart patients had been struck with the city's Freeman Hospital. However, it added that it was a "back-up option" that had never been used. In May the health board said it could not meet the Scottish government's target 12-week timescale for all patients to be given planned surgery. It also said it had been forced to start prioritising the most urgent cases. The issue was raised with the Scottish government by Tory MSP Jamie Halcro Johnston on behalf of a constituent forced to wait three months for surgery. In her reply, Health Secretary Shona Robison said: "The board have indicated they have had a backlog of cardiac patients due to staffing difficulties within their cardiac theatres as well as challenges around critical care capacity and also some emergency admissions requiring urgent surgery. "Unfortunately the impact of this can result in a delay for some patients scheduled for elective admission." Ms Robison said that since mid-July the health board had been using theatre capacity at the Golden Jubilee National Hospital in Clydebank, with some patients undergoing surgery there carried out by NHS Grampian surgeons. She added: "The board have indicated they have also secured a service level agreement with Newcastle and this option has also been offered to patients." Mr Halcro Johnston, who represents the Highlands and Islands, said: "The fact a health board in the north of Scotland is now depending on hospitals in England to treat heart patients shows the depth of the staffing crisis in Scotland's NHS. "It's time for the SNP to admit it's made a mess of workforce planning and apologise to the thousands of patients who're paying the price for these failings. "Travelling to Newcastle for any patient in the Grampian area isn't convenient, but even less so for those with heart problems." Ms Robison later added: "NHS Grampian is committed to making every effort to ensure that their patients have the opportunity to access high-quality healthcare, and their agreement with the Freeman Hospital is an example of these efforts. "However, this service in Newcastle is their third back-up option behind Lothian and Glasgow, and it has not yet been used by patients." She added: "Long waits are unacceptable which is why we have provided an additional £50m to the NHS budget to improve waiting times at all stages of a patient's journey through the health service - almost £5m has been provided to NHS Grampian." A spokesman for NHS Grampian said: "We are committed to ensuring patients are seen as quickly as possible which means, occasionally, people are offered the opportunity of surgery elsewhere during peaks in demand. "We have well-established links with Lothian and Glasgow and our agreement with Newcastle is a back-up option which has not been utilised so far. "People should be assured that our priority will always be to see patients in Grampian. There are also a range of factors which can result in capacity issues and not only down to staffing difficulties. "As a result, we are working with our cardiologists, cardiac surgeons and other key clinicians on a comprehensive redesign of the service that will deliver change and build future capacity in Aberdeen."